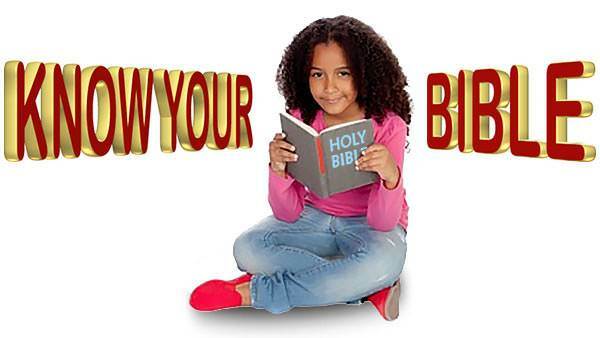 All the lessons in this series are based on Bible passages but with some imaginative scenarios added. 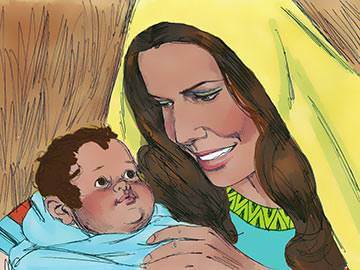 This lesson is based on the Scripture passage on this linked page. There was once a woman named Hannah. 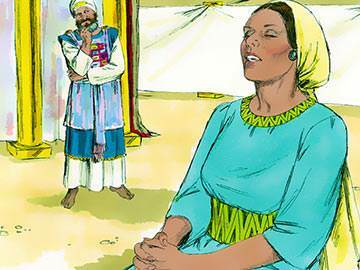 Hannah’s husband, Elkanah, loved her dearly. She lived in a beautiful home in the country. But Hannah was not happy. She was lonely. She had no little boy to play around her all day and to call her “mother”. Sometimes Hannah wanted a little boy so badly that she could not help crying. 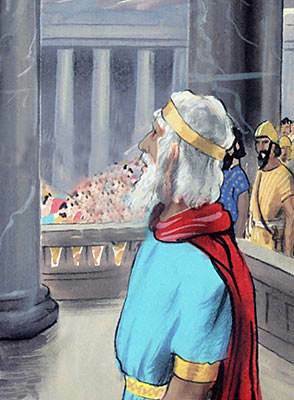 Every year Elkanah made a journey into the town. He went to the church there and thanked God for taking care of them all through the year. Sometimes Hannah went with him. 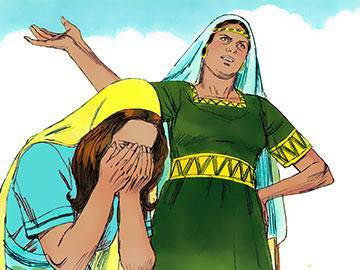 One time Elkanah and Hannah went into the town as usual. They went to the church. 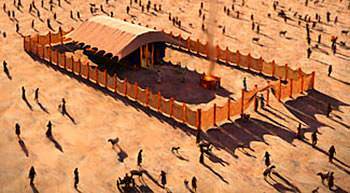 The church then was a tent-church. The walls were made of wood covered with gold. Heavy curtains of red and blue cloth hung over the walls. The door was another beautiful curtain embroidered in beautiful colors. Some of the furniture in the tent was made of gold. There was a golden table. 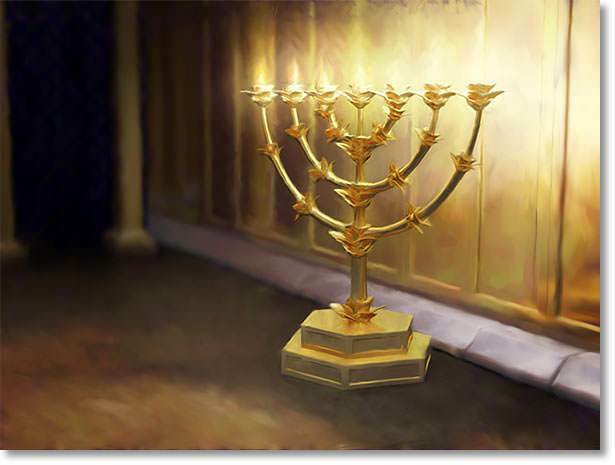 There was a golden stand which held seven golden lamps. The lamps burned day and night. It was a beautiful church. The minister’s name was Eli. Eli was an old man. He could not see very well. He had so much to do that he was often tired. For the curtain-door had to be closed at night and opened in the morning. The lamps had to be filled with oil so that they would burn day and night. The golden furniture had to be rubbed until it shone. The people had to be helped when they came to worship. Eli needed someone to help him. After that Hannah and Elkanah went home. And then one day a little baby boy was given to Hannah. How happy she was! For now she had a little son all her own. Hannah named her baby Samuel. And Samuel grew bigger and bigger until he was no longer a baby but a boy. Hannah did not forget the promise she had made. She told Samuel that soon he would be big enough to go to live in the church and be Eli’s helper. 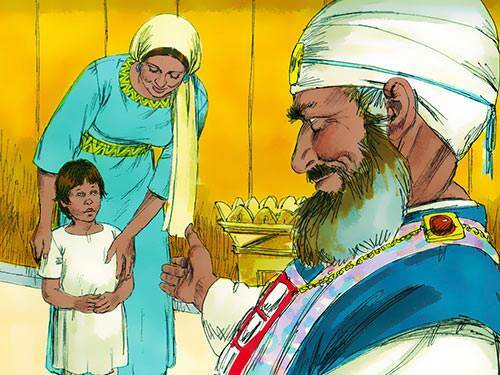 Samuel thought it would be splendid to help take care of the church. 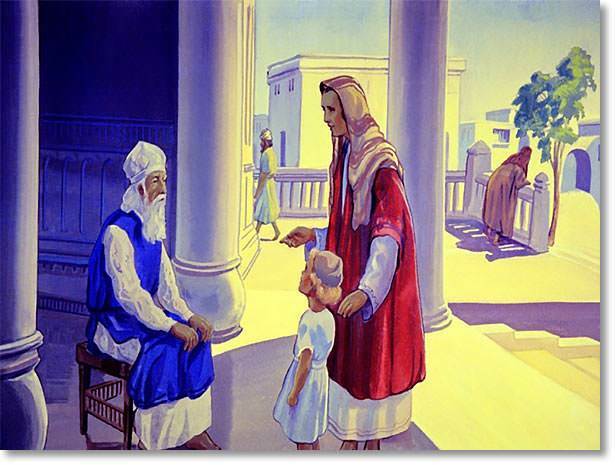 At last the day came when Hannah took Samuel to the tent-church. “I have brought him to be your helper,” she said to Eli. Samuel said “Good-bye” to his mother, and Hannah went home. He missed his mother of course, but he was happy to be helping in the church. There was much that he could do. In the morning he pushed back the heavy curtain-door and let in the sunlight. At night he closed it again. He rubbed and rubbed the golden furniture until it shone brightly. 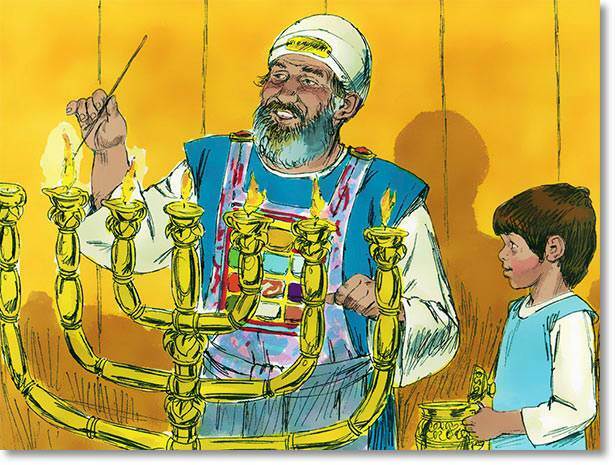 He filled the seven lamps with oil so that they would burn all day and all night. He ran errands for Eli and helped him all he could. Sometimes Samuel’s mother came to see him and bring him presents. Then they had a good visit together. Eli told her what a help Samuel was. And Samuel was very happy to think that he could help so much.